Thousands of years ago, one man was chosen by the divinity to be a prophet of peace and destined to be the founder of a new religion. He was the great Prophet Muhammad, the man who gave birth to Islam and who was given the sacred knowledge of Quran on a sacred month better known now as Ramadan. 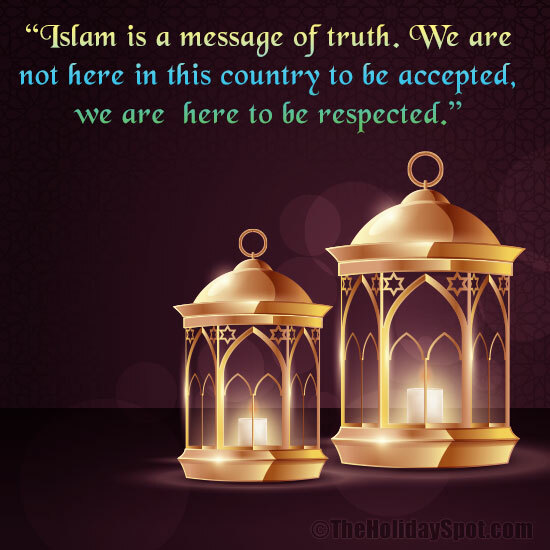 With Ramadan coming up soon, TheHolidaySpot brings you a handful of sacred quotes related to Ramadan from the holy Quran. 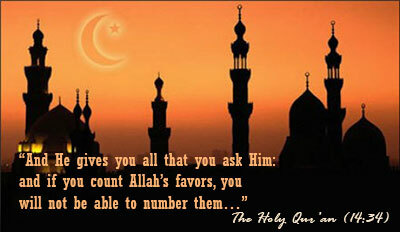 Go through these beautiful Ramadan quotes and imbibe the spirit of the holy occassion. If you like reading these Ramadan quotes, share this page in all social medias like Facebook, Twitter and WhatsApp. Wish you a very happy Ramadan! Read these wonderful Ramadan quotes and get into the mood of the festival. "May your Ramadaan be blessed (Ramadaan Mubarak) and May Allah accept your good deeds as sincerely done for Him (Taqabbal Allaahu minnaa wa minkum)"
"Islam is a message of truth. We are not here in this country to be accepted, we are here to be respected." 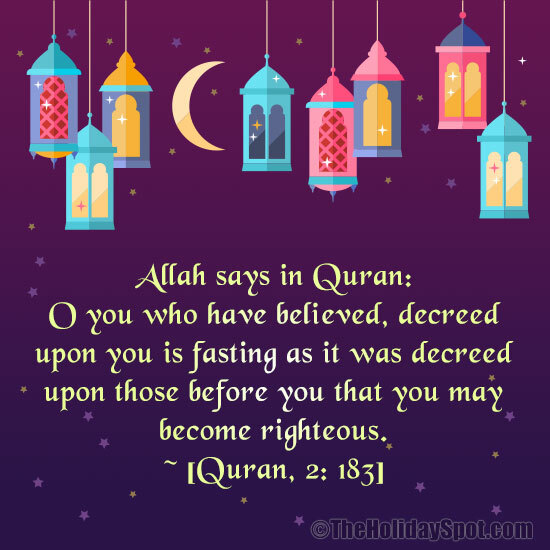 Allah says in Quran: "O you who have believed, decreed upon you is fasting as it was decreed upon those before you that you may become righteous." "I look back and half of Ramadan is over in the blink of an eye. Before I know I will be saying that about my entire life." "(It was) the month of Ramadan in which was revealed the Qur’aan, a guidance for mankind and clear proofs for the guidance and the criterion (between right and wrong). 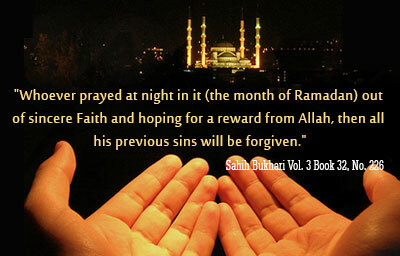 So whoever of you sights (the crescent on the first night of) the month (of Ramadan i.e. is present at his home), he must observe Sawm (fasts) that month…"
"Allah is with those who restrain themselves." "Jesus said " and indeed, Allah is my Lord and your Lord so worship him"
He is the One GOD; th e Creator, the Initiator, the Designer. To Him belong the most beautiful names. Glorifying Him is everything in the heavens and the earth. 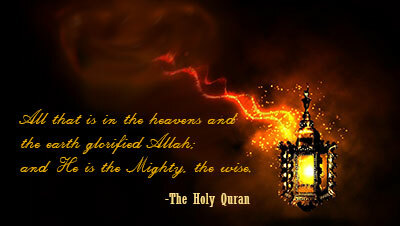 He is the Almighty, Most Wise." "Allaah has made Laylat al-Qadr in this month, which is better than a thousand months, as Allaah says...The Night of Al-Qadr is better than a thousand months. Therein descend the angels and the Rooh [Jibreel (Gabriel)] by Allaah's Permission with all Decrees, there is peace until the appearance of dawn." "Ramadhan is here, Here is Ramadhan. Ramadhan is coming, The time that is blessed. Ramadhan is coming, The time we love best. The month in which the Qur'an was sent; A time of great blessing in which to repent. Fasting for Allah is a great Muslim deed; Controlling desires and Suppressing greed. " "(Fasting) for a fixed number of days; but if any of you is ill, or on a journey, the prescribed number (Should be made up) from days later. For those who can do it (With hardship), is a ransom, the feeding of one that is indigent. But he that will give more, of his own free will,- it is better for him. And it is better for you that ye fast, if ye only knew"
"O ye who believe! 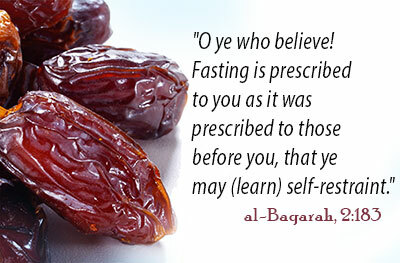 Fasting is prescribed to you as it was prescribed to those before you, that ye may (learn) self-restraint." "O believers, fasting is prescribed to you as it was prescribed to those before you. So that you may become righteous." "When My servants ask you about Me, I am always near. I answer their prayers when they pray to Me. The people shall respond to Me and believe in Me, in order to be guided." "Whoever prayed at night in it (the month of Ramadan) out of sincere Faith and hoping for a reward from Allah, then all his previous sins will be forgiven." "Ramadan is the (month) in which the Quran was sent down as a guide to making and a clear guidance and judgment (so that mankind will distinguish from right and wrong?)" "Whoever Allah wishes to show goodness, he gives him understanding of the religion." 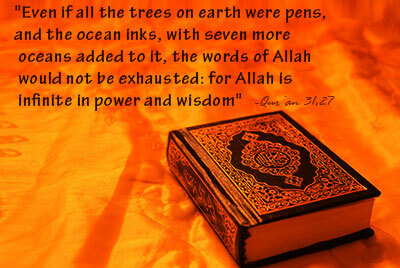 "Even if all the trees on earth were pens, and the ocean inks, with seven more oceans added to it, the words of Allah would not be exhausted: for Allah is infinite in power and wisdom"
"If allah helps you, none can overcome you, and if he forsakes you, who is there after him that can help you?and is allah (alone) let believers put their trust. " "Ramadan is the month whose beginning is mercy, whose middle is forgiveness and whose end is freedom from fire. " 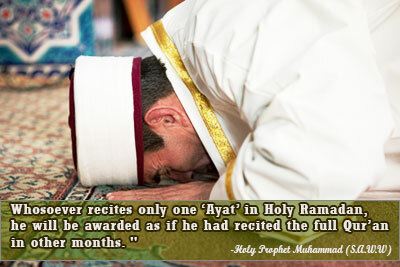 "Whosoever recites only one ‘Ayat’ in Holy Ramadan, he will be awarded as if he had recited the full Qur’an in other months. " "If you avoid the major sins which you're forbidden to do, we shall lessen your (minor)sins, and admit you to a Noble Entrance (Paradiese)."